The greatest sculpture of all time? Perhaps! 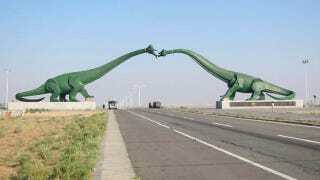 Outside of the 20,000-person Chinese town of Erlian on the Mongolian border, you can find this statue of two amorous sauropods making out for all the world to see. Built to showcase the region's reputation as a fossil hotspot, this reptile snog session instead is a stark reminder that if you build a tourist trap, it's never guaranteed that anyone will show. Dinosaurs Fairyland is never crowded, probably due to its remote location, about 20km outside the town of Erlian in Outer Mongolia. However, this means you will have the park all to yourself, except for the occasional men in military uniform that use the park as a thoroughfare to the bus station. From the top of a nearby hill, you can see the words Dinosaurs Fairyland written in giant letters, in the same style as the iconic Hollywood sign, spelled out across the ground in both English and Mandarin. For those of you who like your dinosaur roadside art in North America and way crappier, see Petrified Wood City.